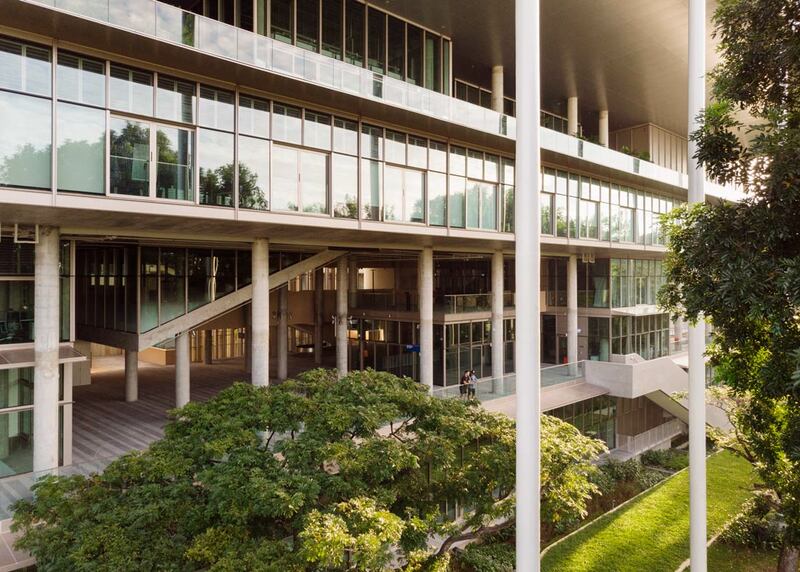 The new NUS School of Design & Environment 4, the first NET Zero Energy building of its kind opens in Singapore; the building, a prototype of sustainable design, combines a stringent net-zero target and a revalidated grammar of tropical architecture. 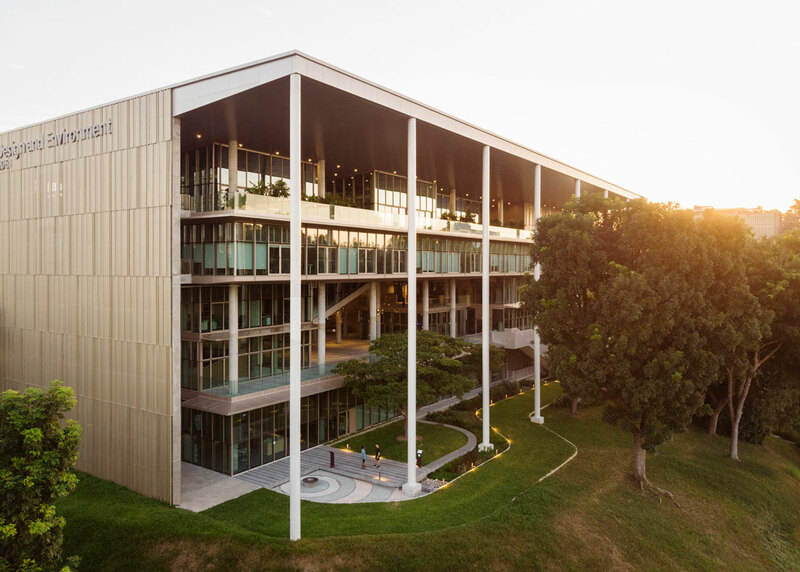 Located on a hillock along Clementi Road near the southern coastline of Singapore, SDE4 is a new addition to the Design & Environment precinct and is part of a larger campus redevelopment. 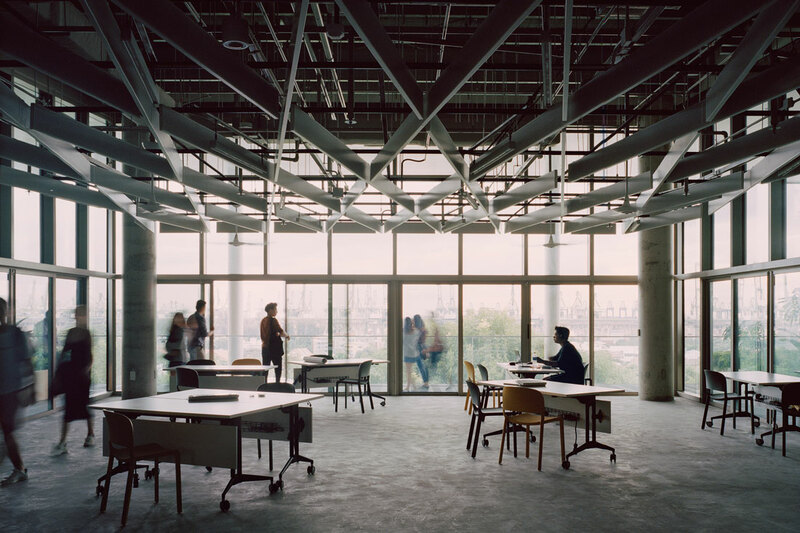 The climate–responsive building includes more than 1,500 square meters of design studio space; a 500-square-metre open plaza; a wide variety of public and social spaces; workshops and research centers; a new cafe and a library. 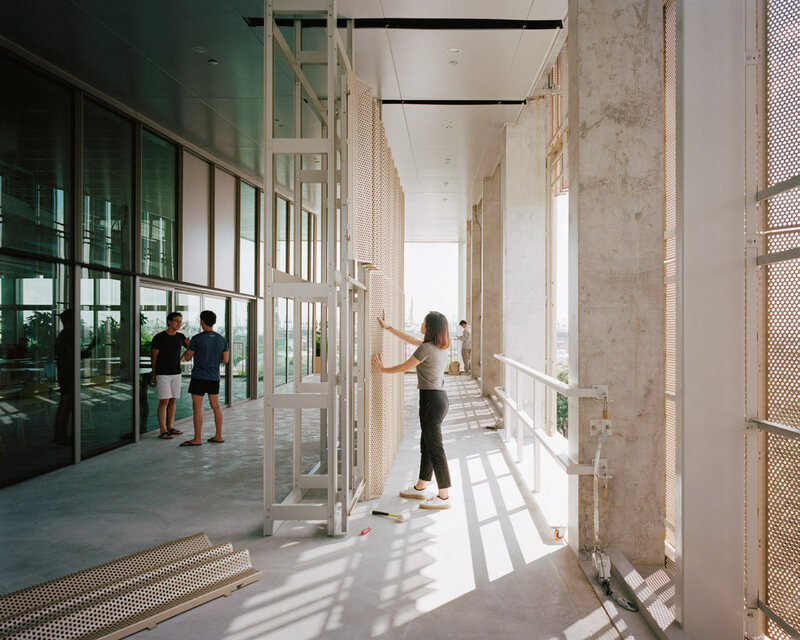 The building’s flexible design and high efficiency reflect the School’s ambitions of promoting new forms of teaching spaces as a scaffold for research. Most of the rooms are designed in a variety of sizes to allow a flexible rearrangement of layout for exhibitions, school-specific installations and future change of use. 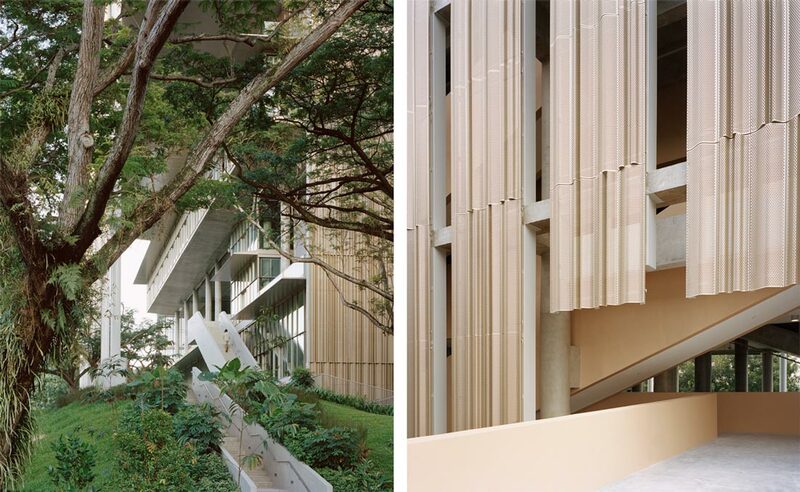 The design carries the principles of vernacular tropical architecture in Southeast Asia. 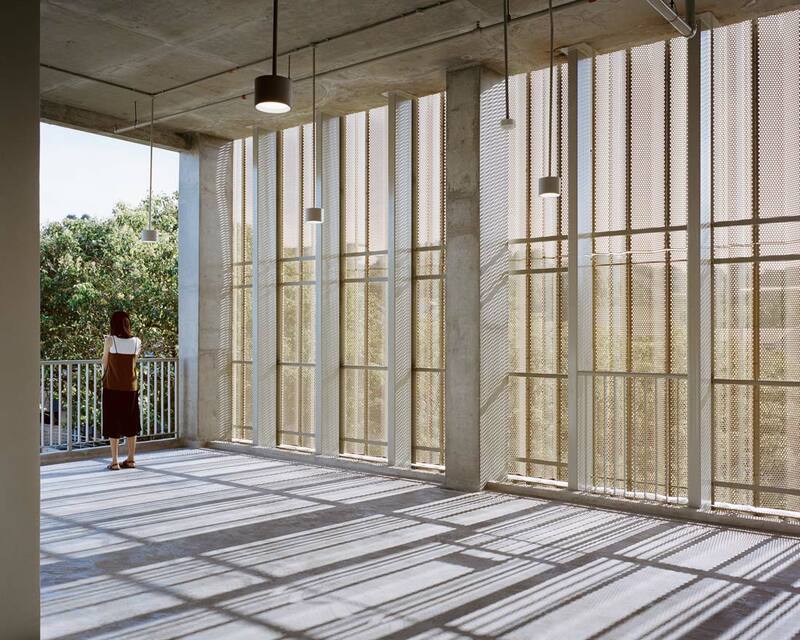 More than 50% of the total area is naturally ventilated, and most of the rooms can be opened to prevailing breezes. Air-conditioning is used only when needed, while the spaces interspersed between cooled volumes benefit from cross-ventilation, acting as thermal buffers/social spaces, emulating the signature tropical verandas. The architecture is punctuated by an alternation of terraces, landscaped balconies and informal spaces. There are no formal boundaries between places to study, work and socialize. Erik L’Heureux, Vice Dean (Special Projects) at the School of Design and Environment, says: “SDE4 represents a scaffold for learning, teaching and research designed for the 21st-century university. Not only does it envision how we teach today but also paves the way for how we might teach in the future.” The interstitial space between the inner and outer skins on the east and west façades is, for instance, designated for research. In these areas, elements of the façade can be dismantled and replaced with new systems, depending on the School’s research needs. 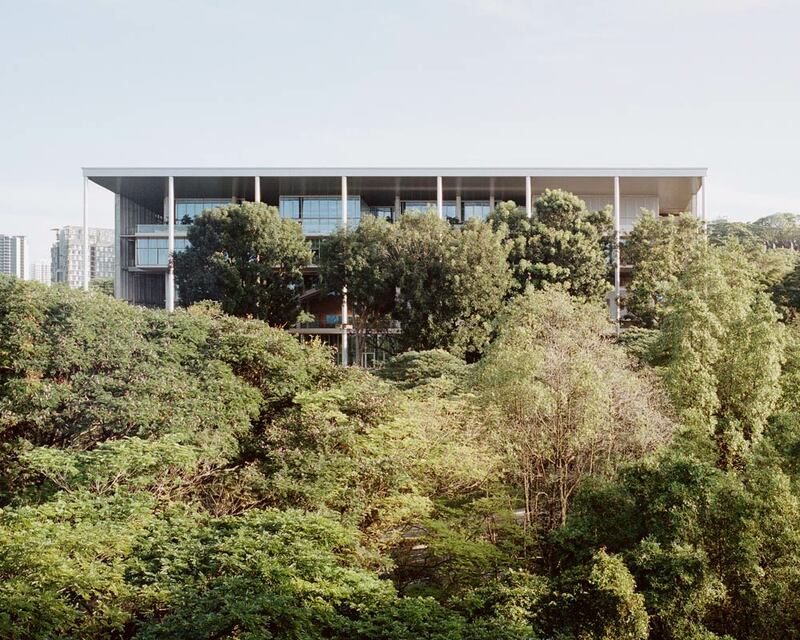 Therefore, the building serves as a canvas for test-bedding and developing relevant green building technologies, becoming, in effect, a living laboratory. 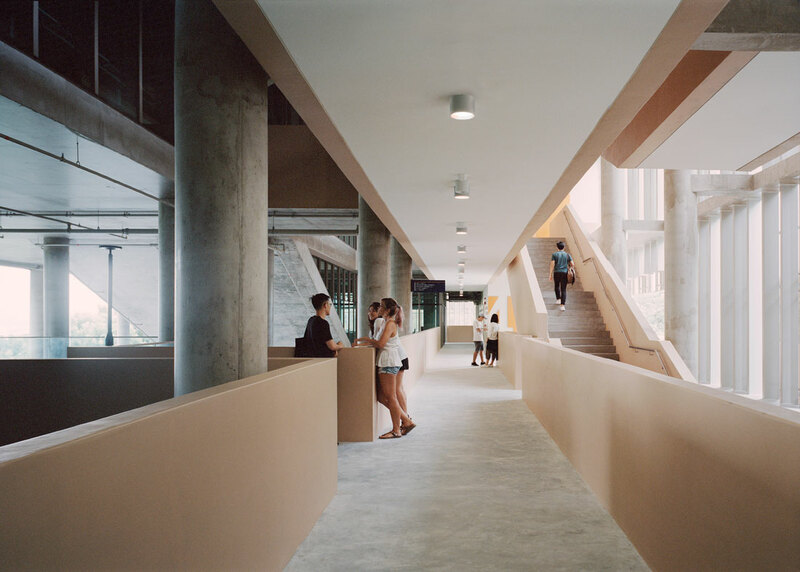 Circulation corridors and straight-flight staircases link and penetrate these volumetric platforms, allowing spaces to bleed from one learning and research space to another, thereby broadcasting a collaborative nature of design. The large over-sailing roof protrudes along the south elevation embedding a tropical portico, built around mature existing trees. This openness allows spaces to flow freely across the envelope of the building, bringing the surrounding landscape into close proximity with interior spaces and vice versa. The east and west façades are designed as a veil: an aluminum curtain that filters sunlight and emphasizes a connection to the surroundings. 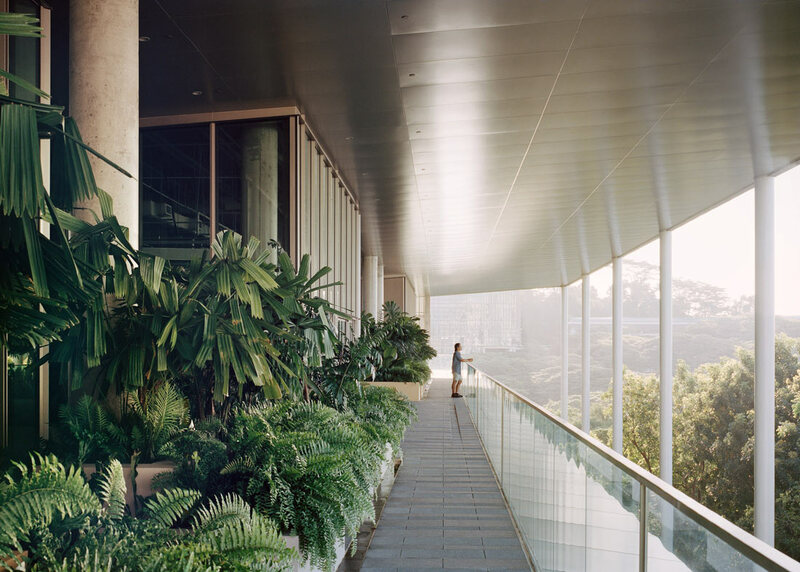 The south gardens are integral to the pedagogical experience of the building. Designed as a natural purification system, the landscape improves water quality while encouraging lifestyle activities and teaching around water. Runoff from the roof and hardscape is cleansed by passing through soil, which removes sediments and soluble nutrients. Nearly 50% of the plants selected are native species and most are from the southern tropics, a choice that also provides opportunities for environmental education. 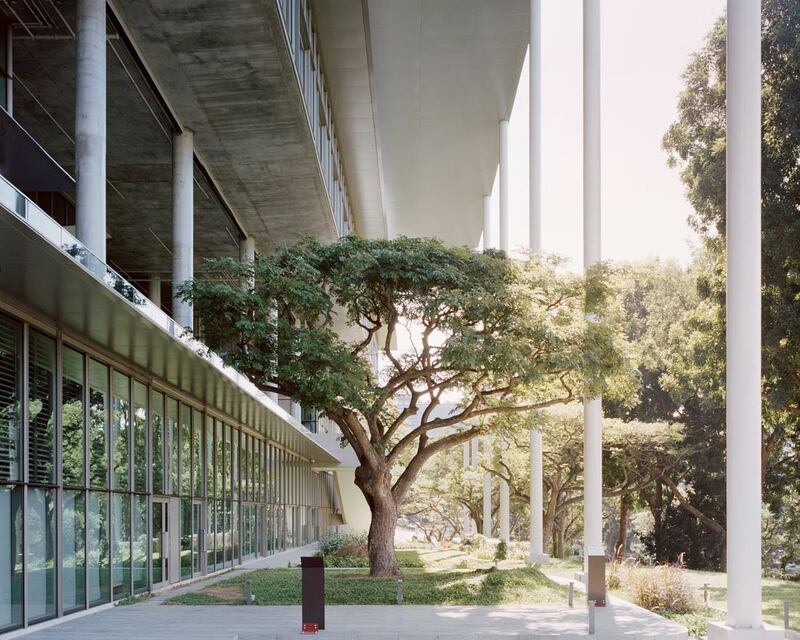 The building has a strong biophilic component in the deliberate use and celebration of the raw and natural characteristics of steel, perforated metal and concrete. 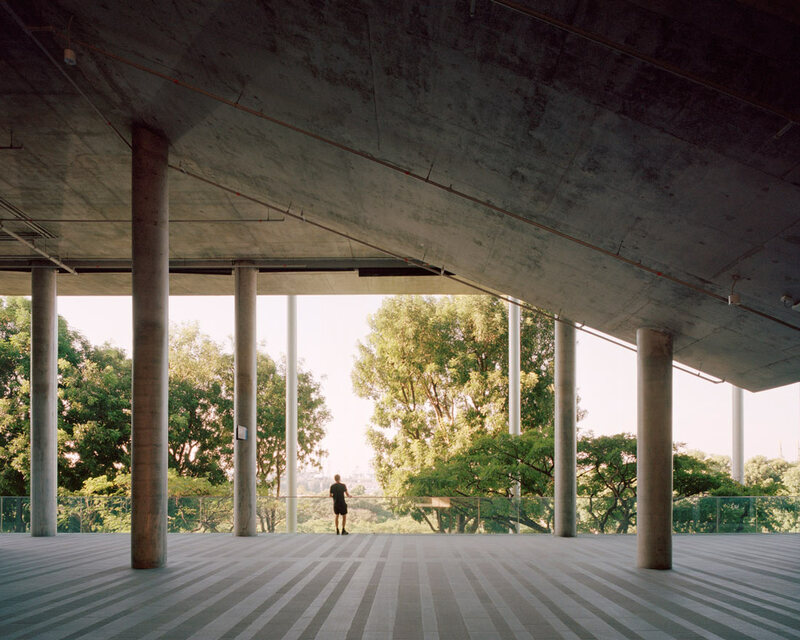 As a result, the finished concrete surfaces are unique; some columns resemble marble, and all possess a tactile quality that enhances the materiality of the architecture. The building is designed to be climate responsive with net-zero energy consumption, featuring a range of sustainable design features and more than 1,200 solar photovoltaic panels on its rooftop. SDE4 exceeds standards of health and wellbeing, creating new avenues for delivering comfort in the tropics. It embraces an innovative hybrid cooling system, designed by Transsolar KlimaEngineering, that supplies rooms with 100% fresh pre-cooled air (albeit at higher temperatures and humidity levels than in a conventional system), and augments this with an elevated air speed by using ceiling fans. This cool circulating air creates comfortable conditions through a highly energy-efficient system. Therefore, the architecture becomes an agent of systemic enhancement—not just to do less harm, but to do systemic good—by making the discussion of design fundamentally public.